This Verdure Aubusson Belgian tapestry we see a verdure scene of autumn colors in the trees with a flowing river. The scene is set in autumn where the colors of the foliage is turning, and here we see the typical hallmarks of a verdure from the 17th century where attention is paid to the foliage to create an artistic portrayal of the foliage and leaves in particular, as well as, in this case, the rendition of the river. A castle is seen in the distance, as well as a hint of the mountains in the horizon. 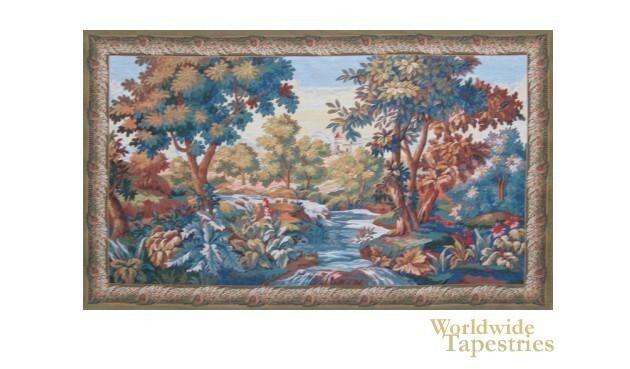 This Verdure Aubusson landscape tapestry is backed with a lining and a tunnel for easy hanging. Note: tapestry rods and tassels, where pictured, are not included in the price. Dimensions: W 69" x H 41"
Dimensions: W 106" x H 69"